A Global workshop was held at UNESCO Headquarters in Paris on 29-30 January 2010 to share the concept of Satoyama Initiative and materialise an action plan and framework for advancing the Initiative and its proposed activities. The primary outputs of the workshop, the Paris Declaration on the “Satoyama Initiative” is now available. The Satoyama Initiative, a global effort led by the Ministry of the Environment of Japan (MoEJ) and the United Nations University Institute of Advanced Studies (UNU-IAS), aims to understand, maintain and restore socio-ecological production landscapes for the benefit of biodiversity and human well-being around the world. 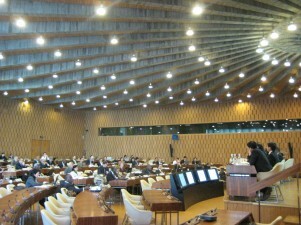 The Global Workshop on the Satoyama Initiative was held at the Headquarters of the United Nations Educational, Scientific and Cultural Organization (UNESCO) in Paris on 29-30 January 2010. The workshop was organized by the Ministry of the Environment of Japan (MoEJ) and the United Nations University Institute of Advanced Studies (UNU-IAS), and co-organized by UNESCO, the United Nations Environment Programme (UNEP), the Secretariat of the Convention on Biological Diversity (SCBD). The Global Workshop was aimed primarily at sharing the Satoyama Initiative concept, and helping materialize a framework for advancing the Initiative and its proposed activities, and built on the two preparatory workshops held in Asia; the first in Tokyo on 25 July 2009, and the second in Penang, Malaysia, on 1-2 October 2009. 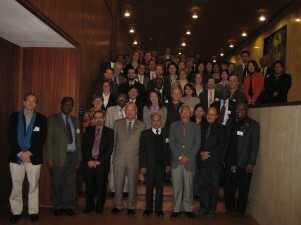 The workshop was open to the public and attended by about 80 participants, including members of the Bureaus of the CBD Conference of the Parties (COP) and the Subsidiary Body on Scientific, Technical and Technological Advice (SBSTTA), and biodiversity and community development experts from intergovernmental and governmental agencies, academic institutions, and non-governmental organizations, in particular those working closely with indigenous and local communities. The primary outcomes of the workshop, the Co-Chair’s Summary and the Paris Declaration on the “Satoyama Initiative”, are now available for download . The Paris Declaration is to be submitted to the Fourteenth Meeting of the SBSTTA, to be held in Nairobi from 10 to 21 May 2010, and the Tenth Meeting of the CBD COP, to be held in Aichi-Nagoya, Japan, from 18 to 29 October 2010.